Natural slate has been used for centuries as a reliable roofing material. Waterproof, fireproof, non-porous and eco-friendly, the rock has a lot of natural features that make it one of the more valued building materials on market. Most slate roofs have a lifespan of over 100 years, and can be removed and recycled to other projects should it outlast its parent building. Slate is a metamorphic rock, meaning that the first rock– the protolith— underwent a chemical transformation to become the finished product. It shares similar properties with sedimentary rocks such as shale– when compressed and heated over thousands of years, the clay within shale breaks down into what is known as mica. Mica, from the Latin word micare, “to glitter, allows the newly formed stone to cleave along flat planes. This is one of the properties that allows slate to be hand-crafted using a hammer and chisel. Slate also contains silicates and quartz, a high level of the latter helping contribute to slate’s shimmery appearance. While the geological location and chemical makeup determines the different color and density of slate, all slates contain iron pyrites. Nicknamed “fools gold” for their misleading appearance, they are iron sulfides that are either “stable” or “unstable” in terms of slate makeup. Stable pyrites have undergone tremendous heat and pressure and thus crystalize, forming small clusters of gold in the rock. Unstable pyrites, however, have not been exposed to enough heat and pressure. Consequently, they have not crystalized, and remain vulnerable to the elements. Unstable pyrites will have a “bleeding” effect, creating a trail of ugly copper residue. Other than being an eyesore, these unstable pyrites will actually burrow a hole through the slate and compromise the roof, if left unattended. The first step taken before quarrying slate is to remove the top layer of slate, or “overburden”, which is sometimes hundreds of feet deep. The overburden has been subjected to the elements for millions of years, and thus has been broken or otherwise compromised. Once this unusable slate has been removed, experts can come in an determine the quality of the rest of the rock underneath. Once the quality of the slate has been determined, extraction can begin. Using diamond-beaded steel cables, large slabs of stone are cut out of the sides of the mountain, creating stair-like formations. While slate can be mined in the fashion of hollowing out mountains, as you would coal, slate quarries are typically massive, open-air endeavors. These huge slabs are then transported to a factory where they are cut down into smaller, more manageable blocks, and sorted. Even though slate comes from the same place, there may be two or more different strains in the same quarry. 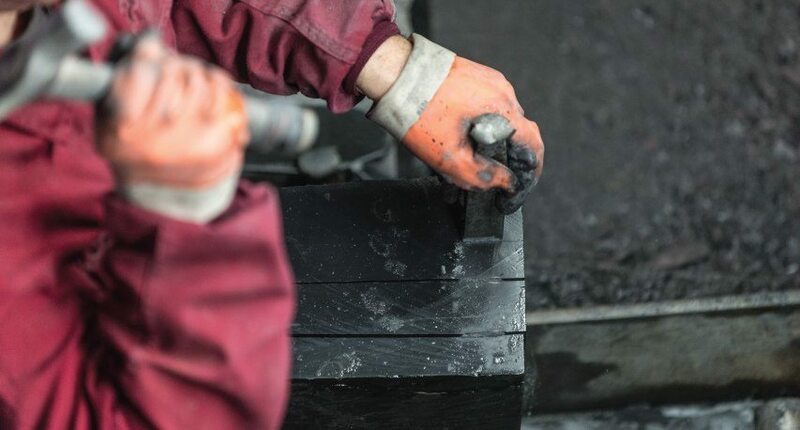 Once sorted, the slate is again carefully evaluated for quality, and passed along to the slate splitters. Slate splitting is done by hand. Using a hammer and a chisel, skilled craftsmen split the rock into desired thicknesses. To finish the process, the ends of the slate are sawn to make them even. Natural slate is considered one of the most eco-friendly building materials due largely in part to its minimal processing. Having been split by hand, and only using minimal factory sawing, harmful CO2 emissions can be avoided. The whole process uses barely any water, even less than the environmentally-hailed terra cotta, and no chemicals are added to the rock. Naturally waterproof and having a Grade A fireproofing rating, not needing to add chemicals ensures that harmful byproducts don’t run off into the environment. Plus, a lifetime of over 100 years lesses the overcrowding of landfills.